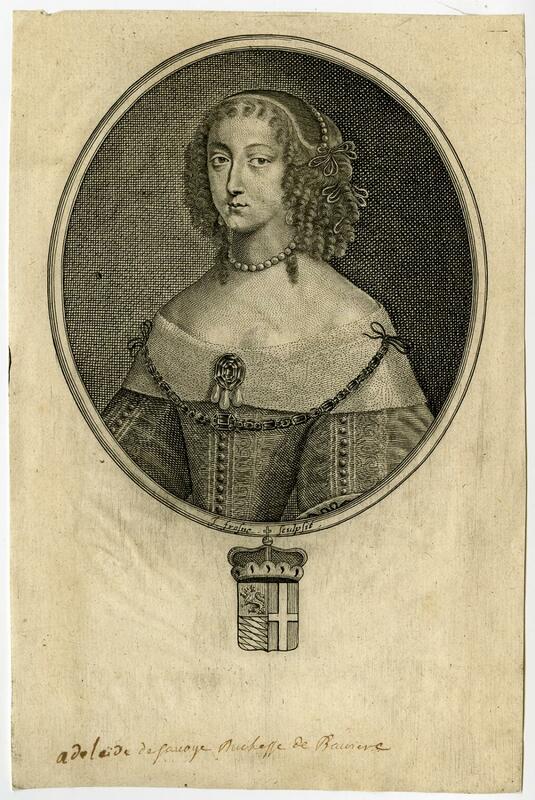 - Antique Master Print, titled: 'Adelaide de Savoye ' - Portrait of Princess Marie Adelaide de Savoye, in the first and third states. Engraving on hand laid paper. Made by 'Jean Frosne ' after own design. Jean Frosne (ca. 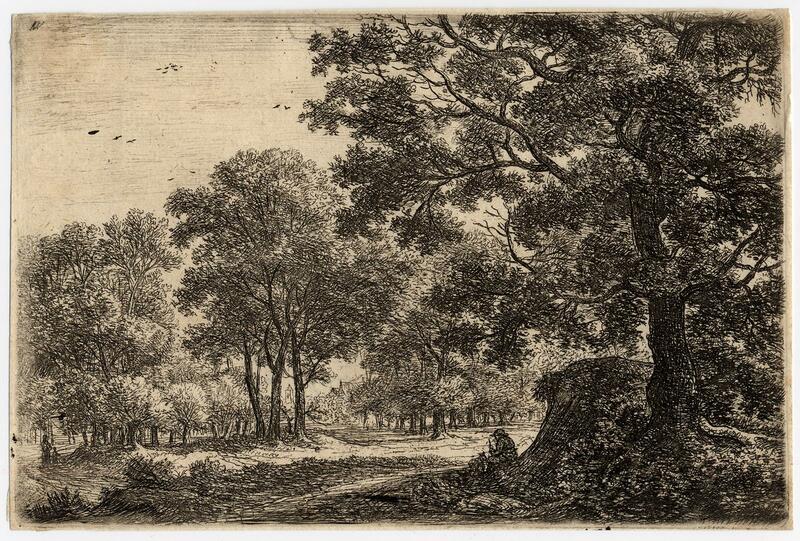 1630 -after 1676) was a French engraver of portraits, landscapes and ornaments. He likely engraved after his own designs. Condition: Very good, given age. No margins, paper slightly wrinkled. General age-related toning and/or occasional minor defects from handling. Please study scan carefully. The overall size is ca. 5.6 x 8.5 inch. The image size is ca. 5.6 x 8.5 inch. The overall size is ca. 14.1 x 21.6 cm. The image size is ca. 14.1 x 21.6 cm. Coryn Boel (Quirin Bol, 1620 Antwerpen &#150; 1668 Brüssel). Der Affenchirurg. 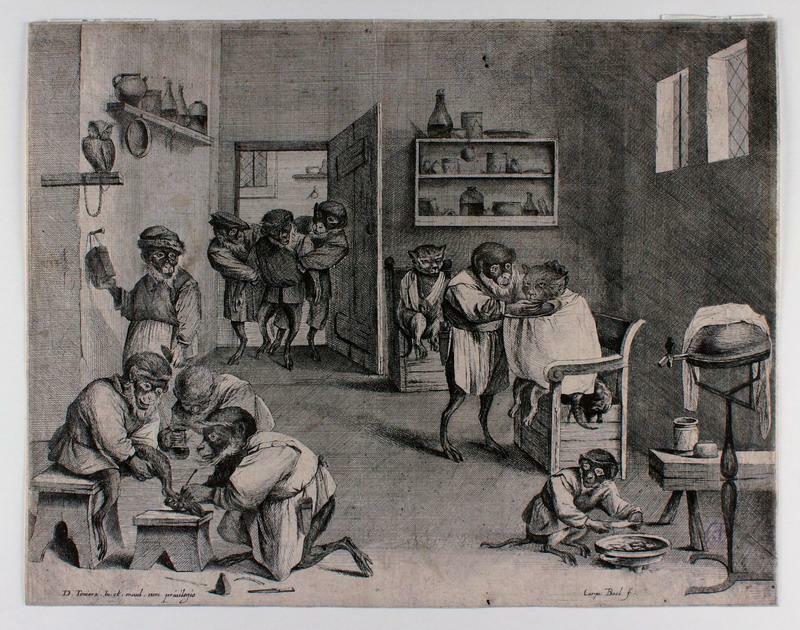 (Auch: Die Affenbarbierstube / La boutique du singe perruquier / The Monkey&#146;s Barber Shop). Original-Kupferstich nach David Teniers II. - Antique print, untitled. It shows: a man and his dog beneath a knoll. Etching, watermark: seven-pointed foolscap. Made by A. Waterloo. Anthonie Waterloo (1610-1690) had a long life, in which he was active not only as an artist, but also as a diplomat. 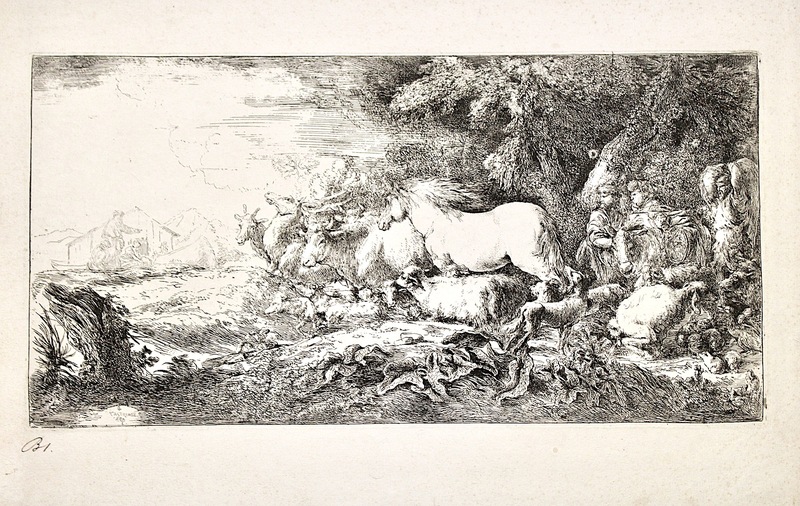 He specialized in landscape art and produced 138 etchings. 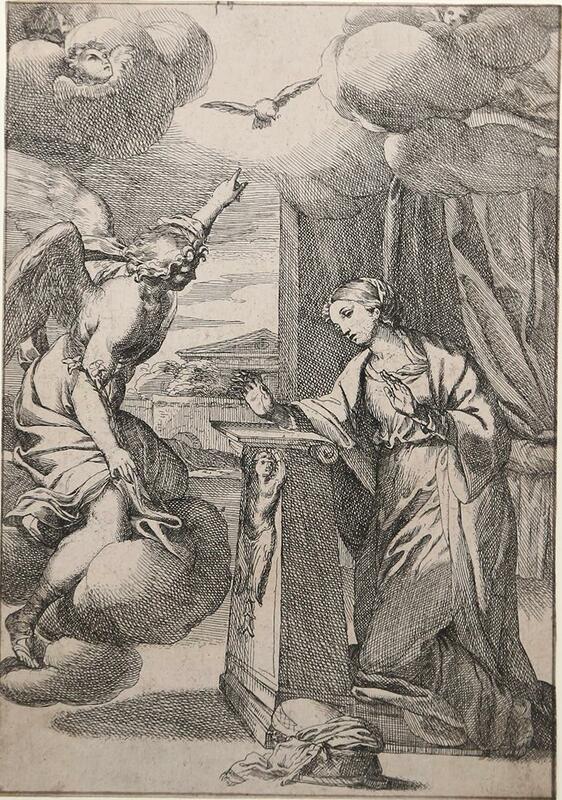 Especially with these prints he gained fame; they were avidly collected in the Condition: Very good, thread margins. Early impression from the collection of J. R. Voute (not in Lugt) General age-related toning and/or occasional minor defects from handling. Please study scan carefully. The overall size is ca. 6.4 x 4.2 inch. The image size is ca. 6.3 x 4.1 inch. The overall size is ca. 16.2 x 10.7 cm. The image size is ca. 15.9 x 10.5 cm. Vipera Pythia. Id est, de viperæ natura, veneno, medicina, demonstrationes, & experimenta nova. Padua: Frambotti. 1650. Small 4to. 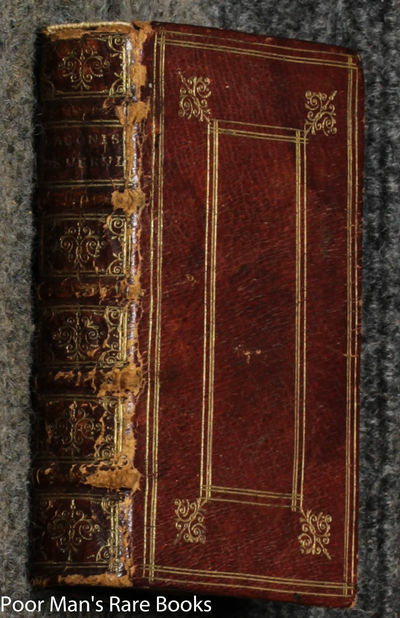 Contemporary vellum binding, later red morocco gilt labels to spine, yapp edges; pp. [xii] + 522 + [xxii], including several engravings and engraved head- and tail-pieces, illustrated half title; circular scratch marks to sides, some loss to labels, discreet repairs to pp. 99-102 and 179-80 without loss, corner of pp. 217-8 repaired with loss affecting final word on p. 217/ occasional browning, generally very good. First edition. Text in Latin. Very scarce; a copy of this edition last came to auction in 1988. A 1651 second issue is far more common. This is a fascinating work on snakes, dealing not only with their anatomy, venom, medicinal properties and the treatment of bites but also with the folklore surrounding serpents. The plates depict not only snake anatomy but also mythical representations of serpents. This reflects the intellectual approach of the author: "[his] works presented a blend of empirical scientific observations and spiritual beliefs and speculations. He believed, for example, that studying anatomy would allow one to understand not just the natural world, but also the divine will and workings of the world's creator. (His mysticism also caught the eye of the Inquisition, who brought him in for questioning, although he was eventually acquitted)" (Timothy D. Murray, Alexander C. Johnston, and Curtis Small, catalogue of University Delaware's Animal Vegetable Mineral exhibition, August - December 2014). Severinus (1580 - 1656) was an Italian surgeon who rose to become professor of anatomy in Naples, where he died of the plague. Osler 3961; OCLC records only three copies of this edition, in the British Library, the University of Glasgow and the Frisian Historical and Literary Centre. The Civil Right of Tythes, Wherein, Setting Aside the Higher Plea..
1650. Tithing to the Church of England During the Commonwealth E[lderfield], C[hristopher] [1607-1652]. The Civil Right of Tythes: Wherein, Setting Aside the Higher Plea of Jus Divinum from the Equity of the Leviticall Law, Or That of Nature for Sacred Services, And the Certain Apportioning of Enough by the Undoubted Canon of the New Testament, The Labourers of the Lords Vineyard of the Church of England are Estated in Their Quota Pars of the Tenth or Tythe per Legem Terrae, by Civil Sanction or the Law of the Land: Which Being the Foundations of All Civill Right Here, Must Needs Render Their Spoliation Wrong, The Taking or Withholding as Injurious as of Any Other Mans Due. Humbly Represented to the Judicious and Pious Consideration of All Sober and Advised Christians, Who Fearing God and Hating Covetousness, Have Learned Christ so Far, As, To Give Every One His Own; And Would do no Wrong for Conscience Sake. London: Printed by Tho. Newcomb, For John Holden, At the Anchor in the New-Exchange, 1650. [viii], 344 pp. Lacking final leaf, errata sheet on recto, blank verso. Quarto (7-1/4" x 5-1/2"). Recent three-quarter calf over pebbled cloth, lettering piece to spine, endpapers renewed. Negligible light rubbing to extremities. Moderate toning to text, light foxing in a few places, margins of some leaves have faint dampstaining, light soiling to title page. $500. 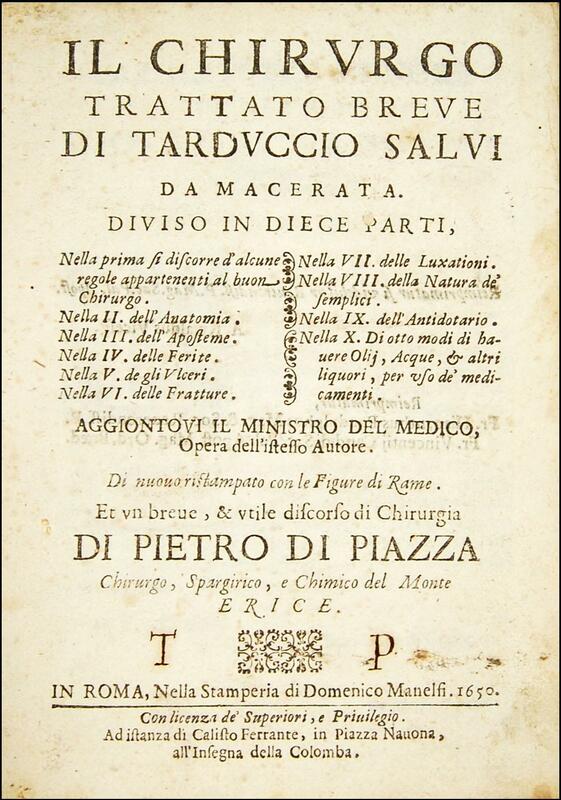 * Only edition, one of two issues from 1650. The Church of England was disestablished during the Commonwealth and Protectorate. As a result, its status shifted with the political climate. Elderfield's treatise defended the Church's right to collect tithes, a right threatened by Puritans in Parliament. Counting both issues, OCLC locates 10 copies in North America, 5 in law libraries (Columbia, Harvard, LA County, Library of Congress, University of Georgia). English Short-Title Catalogue R18717. Il chirurgo trattato breve di Tarduccio Salvi da Macerata. Diviso in dieci parti, nella prima si discorre d'alcune regole appartenenti al buon chirurgo. Nella II. dell'anatomia. Nella III. dell'aposteme. Nella IV. delle ferite. Nella V. de gli ulceri. Nella VI. delle fratture. Nella VII. delle luxationi. Nella VIII. della natura de' semplici. Nella IX. dell'antidotario. Nella X. di otto modi di havere olij, [.] Aggiuntovi Il ministro del medico, [.] Et un breve, & utile discorso di chirurgia di Pietro Di Piazza [.]. 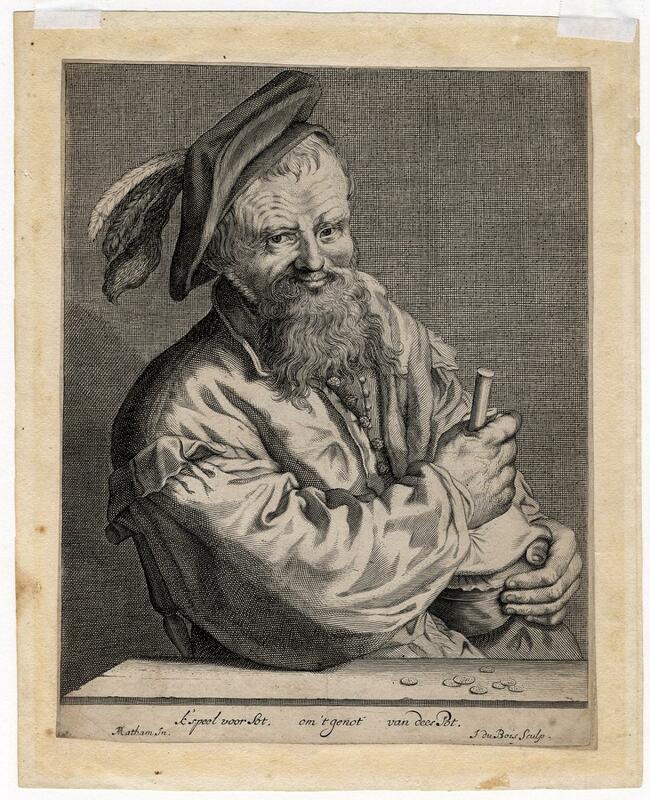 1650 - Portrait of a Foekepot or Rommelpot (Friction drum) player. Engraving, watermark: foolscap. The print is laid down on a sheet of 17th. Century paper from an album. Rare print. State: only state. Ref: Hollstein 2. Made by J. Dubois after J. Matham. 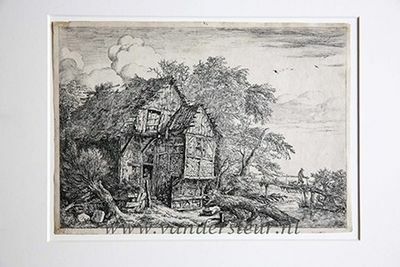 Johannes Dubois (active 1650-1660) is a little known engraver, who made several prints with "genre" subject matter. The overall size is ca. 19.5 x 25 cm. The image size is ca. 19.5 x 25 cm. Very good, no margins. Some browning of the paper General age-related toning and/or occasional minor defects from handling. Lubecca. Lübeck. 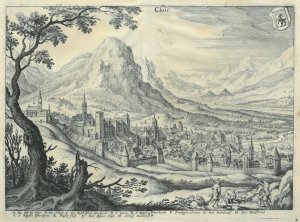 Kupferstich von Merian, um 1650. 19,5 x 36,5 cm. Unter Passepartout. 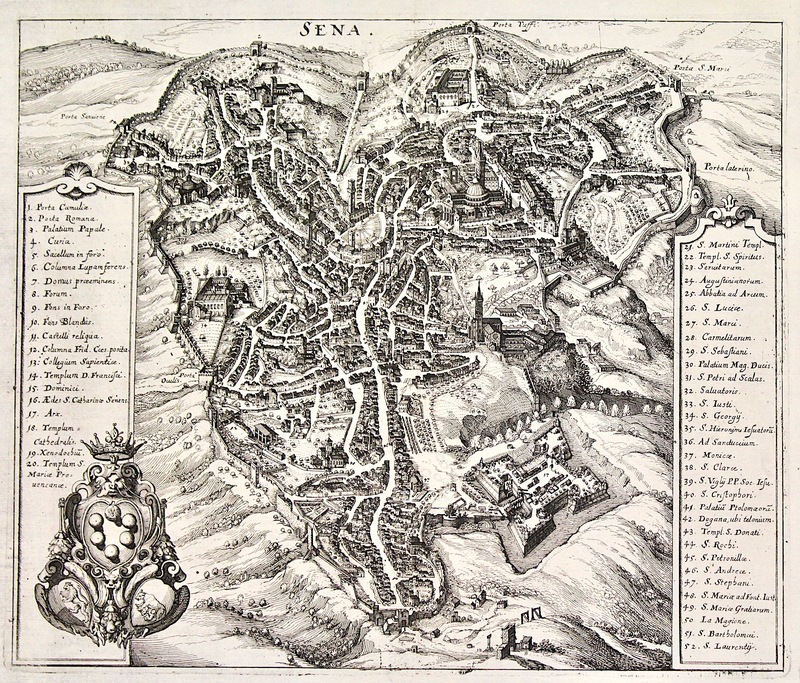 CASTIGLIONE BENEDETTO detto il Grechetto(Genova 1616-Mantova 1665). - Acquaforte, firmata in lastra in basso a sinistra "GB CASTILIONE GEIEP (Genovese Invenit et Pinxit)", eseguita su carta vergata con filigrana ovale non identificata, mm. 207x403 (lastra). Stato unico. Bella prova, impressa su foglio assai marginoso. Uno dei pi? celebri soggetti dell'incisore genovese, databile, secondo Percy attorno al 1650-55 per via di un uso denso e controllato di un chiaroscuro di origine rembrandtesca. Il tema biblico Ë accennato in secondo piano mentre il Grechetto sembra dedicarsi con maggiore attenzione al soggetto animalistico come spesso nelle opere del periodo genovese. Abile incisore, Castiglione fu il primo in Italia ad apprezzare ed imitare le stupende acqueforti del Rembrandt. Esemplare appartenuto alla collezione Georg Denzel, come testimoniato dal timbro di collezione riportato sul cartoncino di supporto. Bellini 61; Bartsch 1 grafica d'autore. Francoforte, 1650 - Incisione in rame, 245x290. Bella veduta prospettica generale della citt? ; ai lati una legenda con 52 rimandi. Ottimo esemplare marginoso. Qualche restauro al margine inferiore. vedutistica. LE MIROIR DE FAUCONNERIE, OU SE VERRA L'INSTRUCTION POUR CHOISIR, NOURRIR & TRAICTER, DRESSER & FAIRE VOLER TOUTE SORTE D'OYSEAUX, LES MUER & ESSIMER, COGNOISTRE LES MALADIES & ACCIDENTS QUI LEUR ARRIVENT, & LES REMEDES POUR LES GUERIR. 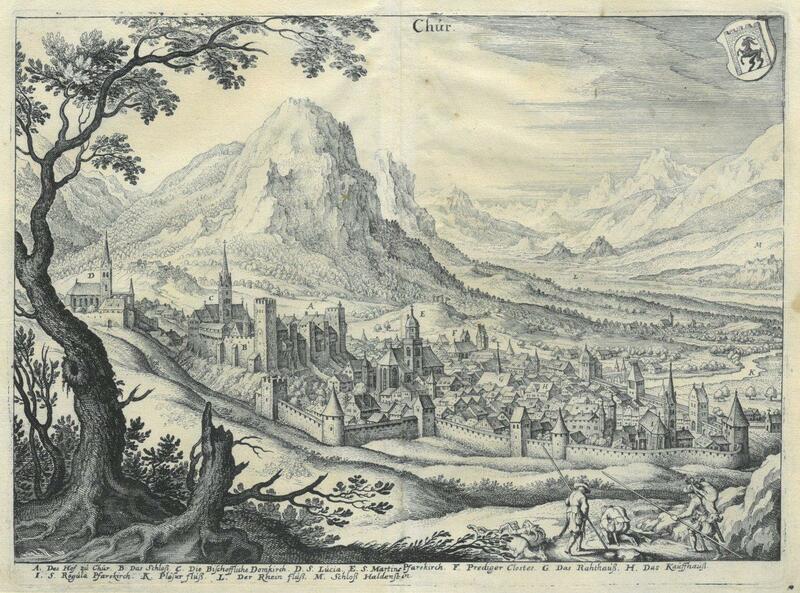 Rouen, Clement Malassis, 1650. Slim 4to, appproximately 225 x 160 mm, 9 x 6½ inches, title with woodcut hunting scene, seven woodcut illustrations of falcons, 38 pages, quarter calf, gilt lettering and decoration to spine, marbled paper covered boards, marbled endpapers. ½ inch split to upper hinge and small repair to head of spine, corners worn at tips with boards just showing, pale age-browning and spotting throughout, bookplates of L. Heron and A.E.H. Swaen to front and rear pastedowns, otherwise a very good copy. This work provides all the information necessary for keeping and training falcons, hawks and other birds of prey: how to choose birds, how to train them; how to treat them throughout the year; how to treat their illnesses or accidents. The author wrote from personal experience, having served two kings as falconer for over 45 years. 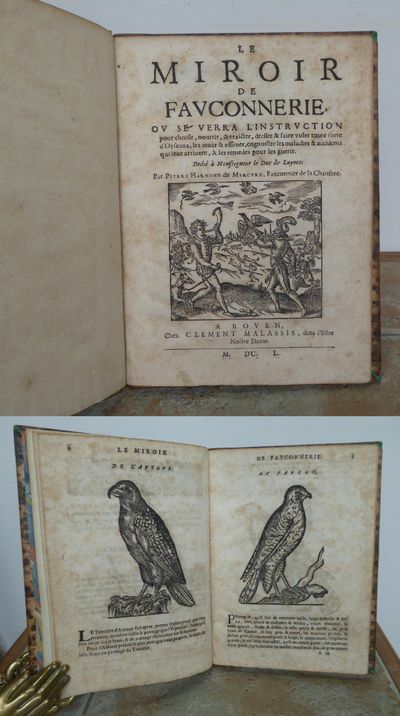 All but the first edition properly form part of Du Fouilloux's La Venerie; See: Carl F. G. Richard Schwerdt Volume I, pages 153 & 230-231 (1620 edition. ); James E. Harting, Bibliotheca Accipitraria, page 83, No. 156; Sotheby's, Bibliotheque Cynegetique du Verne, Paris 5th October 2016, pages 90-91, No. 128 & 129. MORE IMAGES ATTACHED TO THIS LISTING, ALL ZOOMABLE, FURTHER IMAGES ON REQUEST. POSTAGE AT COST. 1650. Incisione in rame, dipinta a mano d'epoca, 280x395, eseguita su soggetto di Georg Hoefnagel; testo latino al verso; tratta da "Theatrum praecipuarum urbium". Bell' esemplare nella usuale coloritura piuttosto ossidata; accuratamente rinforzato in due punti con carta cina al retro e foderata con un velo di carta cina protettiva. Coryn Boel (Quirin Bol, 1620 Antwerpen - 1668 Brüssel). Der Affenchirurg. 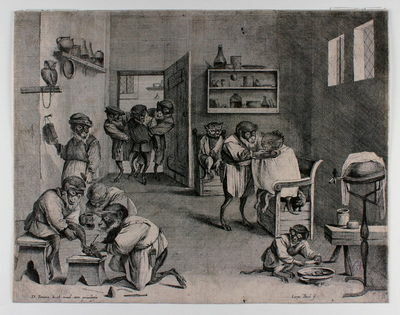 (Auch: Die Affenbarbierstube / La boutique du singe perruquier / The Monkey's Barber Shop). Original-Kupferstich nach David Teniers II. Um 1650.. Ca. 24,5 x 31,5 cm. Mit schmalem, umgehenden Rändchen um die Einfassungslinie, etwas nachgedunkelt, leichte Knitterspuren im Mittelfalz, verso mit sauber hinterlegtem Einriß in der Mittelfalte (ca. 2 cm) und wenigen winzigen, kaum sichtbaren Löchlein. Rückseitig mit älterem Sammlerstempel (Initiale 'CD'). An beiden oberen Ecken auf Trägerkarton gefalzt. Schöner, gratiger Abzug. Le Blanc 52; Hollstein 42. Papier mit WZ Schellenkappe. - Wie alle Radierungen von Coryn Boel und besonders jene, die in der Zusammenarbeit mit Tenier entstanden, sehr selten! Darstellungen von Barbieren, Zahnbrechern (von Zahn-Ärzten mag man nicht nur aus der komfortablen Position des Nachgeborenen kaum reden) und Alchimisten in Affengestalt waren im 17. Jahrhundert besonders populär, galten diese der Bevölkerung doch zumeist als Scharlatane. Teniers bediente dieses Genre mit vielen, detailreichen Bildern und gilt zu Recht als einer der herausragendsten Künstler des Genres. \"I. Martagon Imperiale Moschatum. II. Caryophyllus minor sylvestris flore simplici. III. Caryophillus minor sylvestris flore pleno\". In der Mitte eine große Türkenbund-Lilie, links eine Nelke und rechts eine Garten-Nelke. Darstellung auf 2 Blättern. HORTUS EYSTETTENSIS. - Lilie., "I. Hemerocallis Calcedonica polyanthos. II. Scapuscum bulbo. III. Hyacinthus stellatus autumna lisangustifolys. maior". In der Mitte und links eine Scharlach-Lilie mit Zwiebel, rechts ein Herbst-Blaustern. \"I. Hemerocallis Calcedonica polyanthos. II. Scapuscum bulbo. III. Hyacinthus stellatus autumna lisangustifolys. maior\". In der Mitte und links eine Scharlach-Lilie mit Zwiebel, rechts ein Herbst-Blaustern. HORTUS EYSTETTENSIS. - Scabiose., "I. Scabiosa Indica flore saturate rubro. II. Scabiosa Indica flore dilute rubro. III. Scabiosa tenuifolia flore cinereo". In der Mitte eine Purpur-Skabiose mit gefüllten Blüten, links eine Purpur-Skabiose und rechts eine Tauben-Skabiose. \"I. Scabiosa Indica flore saturate rubro. II. Scabiosa Indica flore dilute rubro. III. Scabiosa tenuifolia flore cinereo\". In der Mitte eine Purpur-Skabiose mit gefüllten Blüten, links eine Purpur-Skabiose und rechts eine Tauben-Skabiose. \"I. Lilium Montanum maximum polyanthos variegatum\". Vielblütige, gefleckte Türkenbund-Lilie mit Zwiebel. \"I. Basilicum Indicum maculatum. II. Basilicum Medium\". Jeweils Basilikum (oder Königskraut). \"I. Helichryson Creticum. II. Dentaria angustifolia baccifera peculiaris. III. Ocimastrum noctiflorum flore albo\". In der Mitte eine gelb blühende Strohblume, links ein zwiebeltragender Zahnwurz und rechts ein Nacht-Leimkraut. \"I. Caryophyllus Indicus flore multiplici luteo peno maior. II. Caryophyllus Indicus flore luteo simplici minor. III. Caryophyllus Indicus flore auro simplici minor\". In der Mitte eine Samtblume, sowie rechts und links jeweils eine Studentenblume. \"I. Moluca odorata spinosa. II. Melißa Officinarum. III. Melißa Moldavica flore coeruleo\". In der Mitte die dornige Muschelblume, rechts eine Zitronen-Melisse (bzw. Garten-Melisse oder Zitronenkraut) und links ein türkischer Drachenkopf (bzw. türkische Melisse). \"I. Herba Paris. II. Digitalis flore`mcarnato. III. Digitalis flore luteo\". In der Mitte die Einbeere, rechts ein roter Fingerhut und links ein großblütiger Fingerhut. \"I. Symphijtum maius flore purpureo. II. Symphijtum maius flore rubro. III. symphijtum flore pallido\". Jeweils der gemeine Beinwell. Den Reghel van Sinte Benedictvs. Manuscript: 1650. 8vo (15,8 x 10,5 cm). (11), 128, (5) pp. Manuscript. Text in 1 column within a frame; 21 to 24 lines to the page. Flexible vellum, spine with 4 raised bands, covers with holes for ties. Calligraphed title-page. 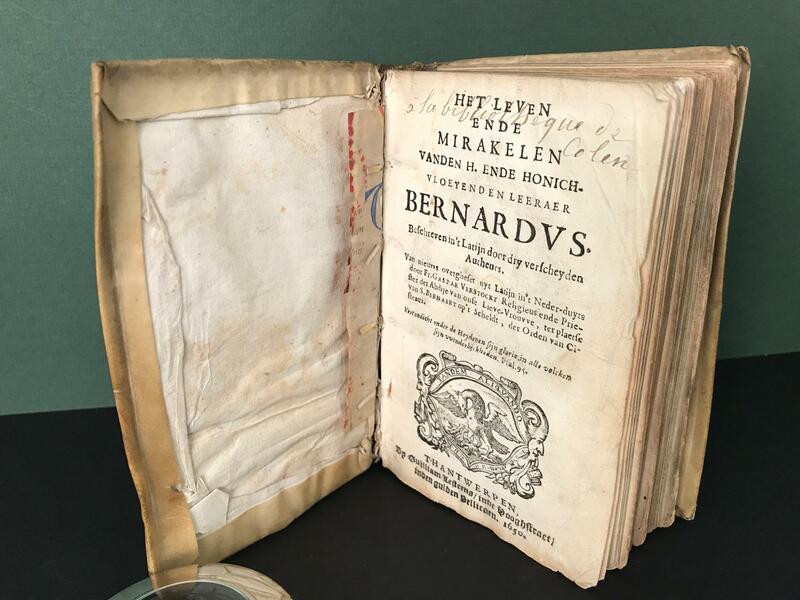 The manuscript, written in Dutch, follows the Dutch editio princeps of the Regula S. Benedicti, but, due to several variations, the manuscript can be considered as a Cistercian version of that book. The first edition of that work in the Low Countries was printed by Guillaume de Neve from Bruges in 1625 (a copy of that title-page is joined). Saint Benedict, father of Roman-Catholic monastic life, was born in Nursia (ca 480) and died at Monte Cassino (543). His Regula Benedicti has been important for the development of church and society in Western Europe, as well for its culture and art. The Regula has not been written to regulate the monastic order, but was intended for laymen to guide them through a life in the spirit of the Holy Scripture. Until now, the Regula has been reprinted innumerable times. A well-kept manuscript, very legible, covers wrinkled and several leaves with waterstains (first and last leaves mostly). .
Rouen, Clement Malassis, 1650.. Slim 4to, appproximately 225 x 160 mm, 9 x 6½ inches, title with woodcut hunting scene, seven woodcut illustrations of falcons, 38 pages, quarter calf, gilt lettering and decoration to spine, marbled paper covered boards, marbled endpapers. ½ inch split to upper hinge and small repair to head of spine, corners worn at tips with boards just showing, pale age-browning and spotting throughout, bookplates of L. Heron and A.E.H. Swaen to front and rear pastedowns, otherwise a very good copy. This work provides all the information necessary for keeping and training falcons, hawks and other birds of prey: how to choose birds, how to train them; how to treat them throughout the year; how to treat their illnesses or accidents. The author wrote from personal experience, having served two kings as falconer for over 45 years. All but the first edition properly form part of Du Fouilloux's La Venerie; See: Carl F. G. Richard Schwerdt Volume I, pages 153 & 230-231 (1620 edition. ); James E. Harting, Bibliotheca Accipitraria, page 83, No. 156; Sotheby's, Bibliotheque Cynegetique du Verne, Paris 5th October 2016, pages 90-91, No. 128 & 129. MORE IMAGES ATTACHED TO THIS LISTING, ALL ZOOMABLE, FURTHER IMAGES ON REQUEST. POSTAGE AT COST. Artist: Coronelli Vicenzo Maria ( - 1718) Venice; issued in: Venice; date: ca 1680 1650 - - technic: Copper print; - colorit: colored; - condition: Some restoration at lower centerfold; - size (in cm): 45 x 60; - description: Map shows the old world in a hemisphere, with the zodiac and temperatur zones outside the hemisphere; -vita of the artist: Coronelli Vincenzo, (1650 ñ 1718)He was a cosmographer, geographer, biographer, encyclopedist, globe maker, inventor and an expert of engeneering and hydraulics. Extraordinarily versatile mind and an extremely tireless man, he produced more than 140 pieces in different genres. At the age of 15, he entered the Franciscan Order, which he then guided as Gran Generale from 1699. He became famous as geographer and mathematician, awakening the interest in these subjects in Italy at the end of the XVII century. Globum huiusmodi, terraqueum [& coelestem] Gulielmo III. invictissimo, ac potentissimo Magnae Britanniaem etc. ...[Dedication signed:] London, Vincenzo Coronelli, 1696. 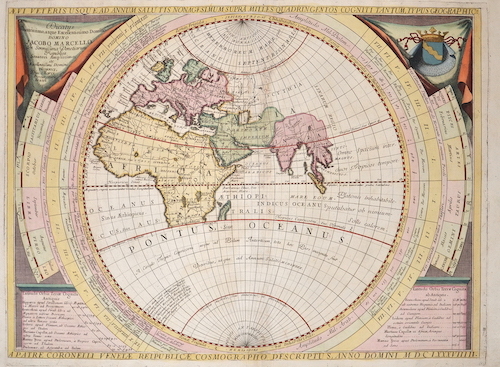 A pair of globes (47 cm diameter), terrestrial and celestial, each with 12 engraved gores and 2 polar calottes. Each globe coloured by a later hand and varnished. Each with a wooden meridian and horizon ring, the horizon ring covered with a reproduction of an engraved sheet and the meridian ring painted in yellow and red with manuscript notes. Each globe in a wooden stand in 17th-century style. Dekker, Globes at Greenwich, pp. 312-316 ( GLB0124-125); Stevenson, Terrestrial and celestial globes, pp. 115-118. A pair of beautiful globes, in their first state, by the celebrated Venetian globe maker Vincenzo Coronelli (1650-1718), who worked extensively for the French and British markets. His reputation in the field was established in 1681 with the production of the so-called Marly globes' ... made for the French king, Louis XIV. Coronelli seems to have sensed that the nobility of Europe wanted grand globes. These, then, he would provide! (Dekker, p. 112). One of them is the present pair of globes dedicated to William of Orange, Stadholder of The Netherlands and King of England as William III.In geographical names the map records are very full, these being given either in Italian, Spanish, Latin, Dutch, English, or in the native language of the country in which they appear. ... Legends are exceedingly numerous, many of them recording incidents relating to certain expeditions or to certain discoveries, such as the expedition of Magellan; early expeditions along the west coast of North America, including reference to Cortes, Ulloa, Alarçon, Cabrillo, Guzman, Drake, expeditions to the East Indies, including that of Le Maire, Hoorn, Van Diemen, Chaumony, and others. Boundary lines of local regions, in both the Old and the New World are exceedingly numerous, which fact in itself gives a somewhat unique value to the map as of geographical and historical value. California appears as an island, and a great stretch of ocean appears between northwest North America and northeast Asia wherein is located land with indefinite outline marked, 'Terra de Jesso ó Jeco, Yedco, Esso et Sesso Scoperta dagli Hollandesi 1'anno 1643. The map of North America is particularly of interest and value, especially for the region of the United States (Stevenson).Thirty-eight constellations are designated in the northern hemisphere, twelve in the zodiac, and thirty-three in the southern hemisphere, thus adding thirty-five to the number as given by Ptolemy. Instead of Ptolemy's 1022 catalogued stars, including fifteen of the first magnitude, forty-five of the second, two hundred and eight of the third, four hundred and seventy-four of the fourth, two hundred and seventeen of the fifth, forty-nine of the sixth, and forty which were nebular and indistinct, Coronelli gives the number as 1902, including eighteen of the first, sixty-eight of the second, two hundred and thirty-seven of the third, four hundred and ninety-six of the fourth, four hundred and eighty-nine of the fifth, five hundred and sixteen of the sixth, and seventy-eight which were nebular and indistinct. Five of the latter, having been discovered in the previous one hundred and twenty-five years, had wholly or in part disappeared in Coronelli's day, of which, that making its appearance in the constellation Cassiopeia in the year 1572 disappeared in the year 1574, that discovered in the year 1596 in the Whale was rapidly diminishing in size, that discovered by Tycho Brahe in the Swan in the year 1600 ceased to be visible in the year 1629 to reappear in the year 1659, that in the Serpent larger than the planet Jupiter which was visible but thirteen months, that in the head of the Swan discovered in the year 1670 and still visible (Stevenson on the 1688 celestial globe, largely matching the present vesion).One of the celestial globe's cartouches has some minor damage and another's left side doesn't align exactly with its right. Some restorations to the paper and with the printed horizon rings in facsimile. A beautiful pair of globes. Verhandelinge van de opvoedinge en ziekten der kinderen. Vertoonende op wat wyse de kinderen gezond konnen blyven, en ziek zijnde, bequamelyk konnen herstelt werden. Zeer nodig voor alle huyshoudende lieden.Amsterdam, Hieronymus Sweerts, 1684. 8vo. 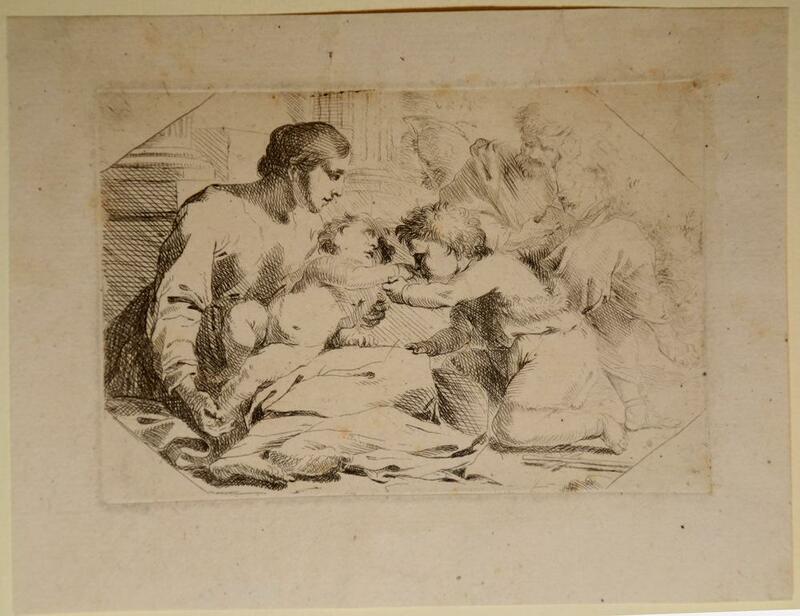 With an engraved title-page showing a hospital scene and 19 figures on 6 engraved plates. Near contemporary vellum. BMN I, p. 279; Krivatsky 1338; G.A. Lindeboom, Geschiedenis van de medische wetensch. in Nederland, pp. 93-95; STCN (3 copies); Waller 1120; not in Wellcome. Rare first and only early edition (here with the dedication in the rarer first of two settings) of one of the first medical books on raising and educating children and especially on paediatrics. Intended for parents, it offers advice and instructions for treating all sorts of children's illnesses, common and rare, as well as tips on the prevention of disease. It gives detailed descriptions and instructions for many home recipes that the parents themselves can prepare and administer to the children. Two appendices follow the three main parts: the first called "Verscheide aanmerkingen aangaande de kinder-ziekten" (Various notes on children's diseases) with 23 numbered case studies, including a description of a child whose body was covered with scales except for his head (gossips blamed his mother for thinking about fish when she was pregnant! 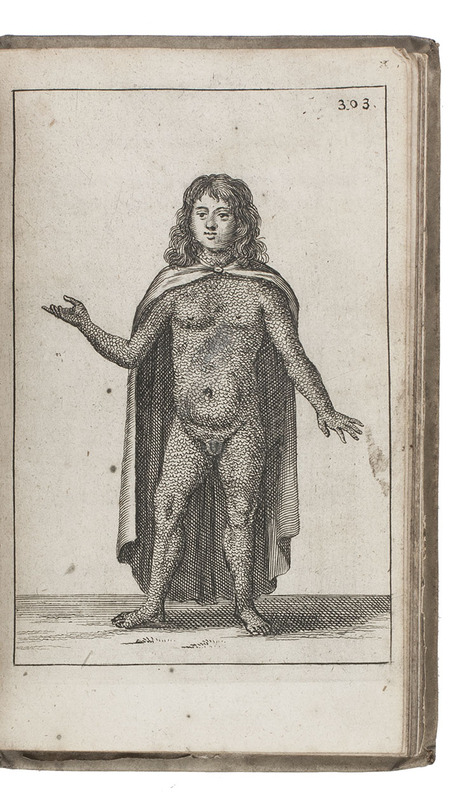 ); the second, translated from the English, called "Historie der Japanse campher" (History of Japanese camphor.Steven Blankaart (1650-1704) at Amsterdam, one of the most important physicians of the 17th century, wrote many popular medical treatises, books on anatomy, surgery, etc., including an herbal and a large work on insects. He was the first to introduce Cartesianism into medical science and one the first scientific and empiricist physicians. With bookplate and with an occasional pencilled note or mark. With occasional small ink spots or faint marginal stains, but still in good condition. The binding somewhat soiled but also good. Het Leven Ende Mirakelen Vanden H. Ende Honichvloeyenden Leeraer Bernardus - Beschreven In't Latijn Door Dry Verscheyden Auhurs - Van Nieuvvs Ovefgheset Uyt Latijn In't Neder-Duyts Door Fr. Gaspar Verstockt Religieus Ende Priester Der Abdije Van, etc. 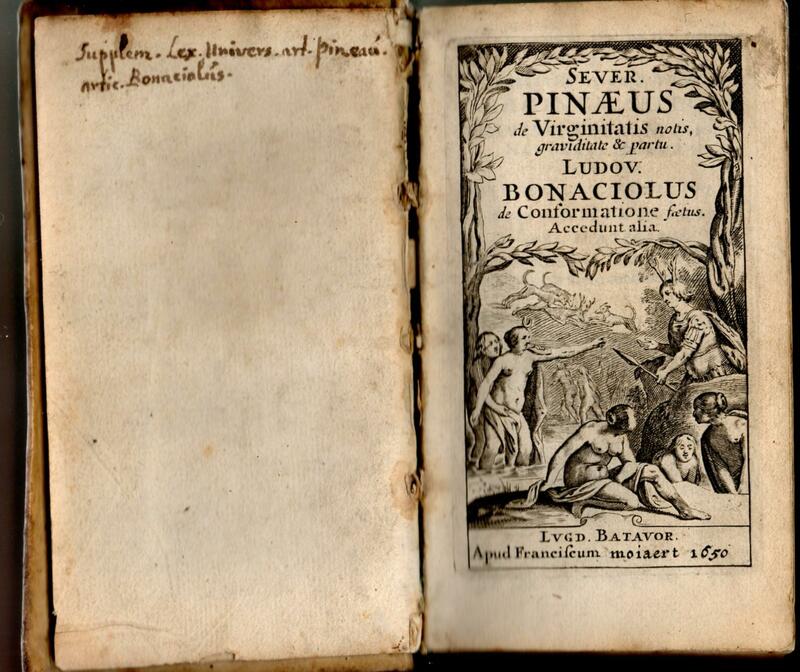 Pineaus, Severin; Bonaciolus, Ludovicus et al. De integritatis et corruptionis virginum notis. De virginitatis notis, graviditate et partu. Ludovicus Bonaciolus: De conformatio foetus. Accedunt alia. CHUR., Gesamtansicht von einer Anhöhe aus. CHUR. Gesamtansicht von einer Anhöhe aus. 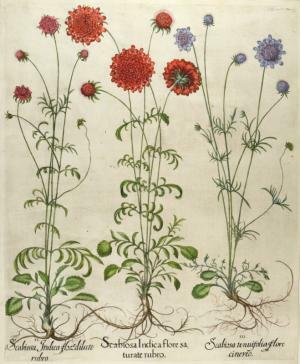 - Kupferstich von M. Merian, 1650, 21 x 28 cm. Zodiaco della Chiesa milanese [cioè le vite de' suoi dodici primi pastori, distinto in tre parti. Con l'aggiunta delle attioni de' santi Simpliciano Cattani, et Senatore Settali, arcivescovi pure di essa..]. Giovanni Battista e Giulio Cesare fratelli Malatesta, 1650. In-4° (cm. 22,5), legatura coeva in p. pergamena semi-rigida con titolo ms. e antica etichetta al dorso, tagli spruzzati; pp. 411  112, 36, 123  in ottimo stato, fresche, con frontespizi inquadrati in cornice per ciascuna parte, oltre a 1 antiporta, 1 ritratto dell'autore, 1 ritratto di Sant'Ambrogio, 1 ritratto di San Simpliciano, tutti incisi in rame n.t., molti deliziosi fregi in silografia; integrazione all'angolo della c.H con fastidio al testo, strappo riparato alla c.K2. La 1^ sezione divisa in tre parti contiene le vite dei primi dodici arcivescovi, la 2^ sezione contiene la vita di San Simpliciano, la 3^ la vita di Senatore Settala, la 4^ le memorie dello Stato di Milano. Edizione originale di «opera importante per la storia ecclesiastica, ed anche civile, dello Stato di Milano. Le singole parti sono per lo più citate separatamente dai bibliografi: ciò si deve non tanto all'autonomia di stampa e di contenuto che dà a ciascuna una propria individualità, quanto alla rarità dell'opera» [Piantanida 4663]. Cfr. Predari 256 e 176; Hoepli 847; Lozzi 2680. Esemplare molto buono. - BMN I, p. 279; Krivatsky 1338; G.A. Lindeboom, Geschiedenis van de medische wetensch. in Nederland, pp. 93-95; STCN (3 copies); Waller 1120; not in Wellcome. Rare first and only early edition (here with the dedication in the rarer first of two settings) of one of the first medical books on raising and educating children and especially on paediatrics. Intended for parents, it offers advice and instructions for treating all sorts of children's illnesses, common and rare, as well as tips on the prevention of disease. It gives detailed descriptions and instructions for many home recipes that the parents themselves can prepare and administer to the children. Two appendices follow the three main parts: the first called "Verscheide aanmerkingen aangaande de kinder-ziekten" (Various notes on children's diseases) with 23 numbered case studies, including a description of a child whose body was covered with scales except for his head (gossips blamed his mother for thinking about fish when she was pregnant! ); the second, translated from the English, called "Historie der Japanse campher" (History of Japanese camphor.Steven Blankaart (1650-1704) at Amsterdam, one of the most important physicians of the 17th century, wrote many popular medical treatises, books on anatomy, surgery, etc., including an herbal and a large work on insects. He was the first to introduce Cartesianism into medical science and one the first scientific and empiricist physicians. With bookplate and with an occasional pencilled note or mark. With occasional small ink spots or faint marginal stains, but still in good condition. The binding somewhat soiled but also good. \"I. Lilium Montanum maximum polyanthos album rubris maculis aspersis\". Weiße, gefleckte Türkenbund-Lilie mit Zwiebel. Lugd[Uni] Batav[Orum] : Ex Off. Adriani Wyngaerden. Very Good with no dust jacket. 1650. Leather. [xxiv], 404 pages; OCLC Number: 905795411. 3.125" x 5.125". Early printing of this seminal work. Bound in 17th or 18th century leather ruled and decorated in gilt. Engraved title page with two ships. A philosophical work by Francis Bacon, written in Latin and published in 1620. This is an early printing of that book. "Title page of Novum Organum depicts a galleon passing between the mythical Pillars of Hercules that stand either side of the Strait of Gibraltar, marking the exit from the well-charted waters of the Mediterranean into the Atlantic Ocean. The Pillars, as the boundary of the Mediterranean, have been smashed through by Iberian sailors, opening a new world for exploration. Bacon hopes that empirical investigation will, similarly, smash the old scientific ideas and lead to greater understanding of the world and heavens. This title page was liberally copied from Andrés García de Céspedes's Regimiento de Navegación, published in 1606. ". With thanks to Wikipedia Woodcut initials. Sound and clean copy. .
Paris: Edme Martin, 1650. 325pp with an index. 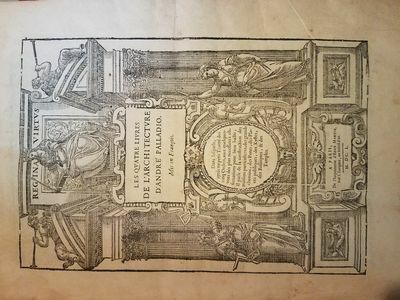 This is a rare copy of the first translation of Andrea Palladio's "Quattro Libri dell' Architettura" into French. It was made at the behest of Cardinal Richelieu who wanted to "put architecture back on the right path." This edition has 200+ engravings made from the original woodblocks that were used when Palladio's book was first printed in Venice. The four books are bound together in a small folio as one, each with a ornamental title page. It includes a dedication to the King of France (Louis XIII) and his Counsel, a preface and a glossary at the end - additions that were added by the translator, Roland Fréart de Chambray. The front cover board is missing, the spine is only partly there, but the back board is present and the binding is intact. There is a light water stain along the top margin, barely visible until the end of the book where it is more pronounced. The book is complete, rag-paper with all the woodblock prints of Palladios architectural drawings. Please see photos. About the book and its historical significanceThe four books of architecture (in Italian: I quattro libri dell'architettura ) are a treatise on Architecture in four sections called "books" and written as well as abundantly illustrated with plans, sections, elevations and details of architectural elements by the Italian architect Andrea Palladio. Palladian architecture grew in popularity across Europe and, by the end of the 18th century, had extended as far as North America. It inspired the architects who worked on the Palace of Versaillesunder Louis XIV. Thomas Jefferson, President of the United States, was a keen admirer of Palladio and once referred to the book as "the Bible". The Four Books was used to inform his own work as the architect of Monticello and the University of Virginia.